Mosquitos go hand in hand with warm weather, unfortunately. They show up uninvited, making a nuisance of themselves, inflicting discomfort on their innocent victims. Keeping them away from yourself, your guests and your children becomes a high priority, especially with the continued rise in mosquito-borne illnesses. Warding them off doesn't have to involve dangerous chemicals or a tacky-looking bug zapper, though. The following 10 plants are specimens to add to your garden or flowerbeds to repel mosquitos naturally. As an extra bonus, many of them have other household or culinary uses too. Most people are familiar with citronella and know that it's a common ingredient in mosquito-repelling products. What they aren't aware of is that citronella is a beautiful perennial grass that grows in clumps 5 to 6 feet tall and emits a strong aroma. It is easy to grow and the scent is more powerful than manufactured repellents, making it an effective plant to add to the yard to keep mosquitoes at bay. These cheerfully bright, annual ornamentals contain pyrethrum, a natural form of the compound, pyrethrin that is found in most commercial insect repellants. Marigolds emit this botanical insecticide from their flowers, leaves and roots. According to NewScientist, this unique smell – a characteristic of the volatile insecticide – is especially toxic to mosquitoes that carry yellow fever and malaria. Scented geraniums have beautiful, bold, fragrant blooms known for repelling mosquitoes and other insects. The lemony fragrance is thought to be reminiscent of citronella grass and overpowers the mosquito's ability to smell. Eating garlic by the handful won't prevent mosquitoes from bothering you, but planting it in your garden helps. The natural odiferous compounds given off by the plant are strong enough to keep insects at a distance. Both the scent and the taste of peppermint plants deters mosquitos and other insects. As an added bonus, if you do get bitten, MedicalNewsToday recommends using peppermint oil on mosquito bites because of its cooling sensation on the skin; rub the leaves directly on an affected area for relief. Essential oils in the leaves of lavender plants give off a soothing fragrance that acts as a natural mosquito (and sometimes deer and other critters) repellent. Once established, lavender plants are drought-tolerant and very hardy. 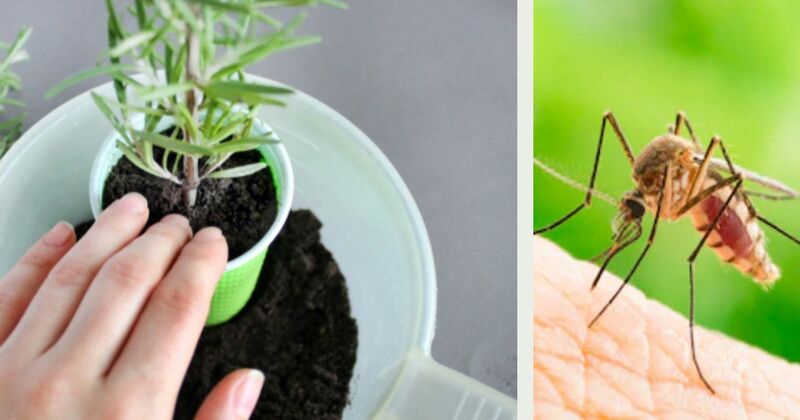 If you have problems with mosquitoes in the house, try growing a potted lavender plant on an indoor windowsill. The woody scent of rosemary is also very effective at keeping mosquitoes away. Rosemary plants do well in hot dry, climates and thrive in containers. The plants also attract butterflies and add flavor to many culinary dishes. Another plant from the mint family, catnip was proven by researchers at Iowa State University to be significantly better at repelling mosquitoes than DEET, the compound in most commercial repellents. The oil found within plants is even effective at much lower concentrations than DEET. When most people think of basil their mind automatically thinks of its culinary uses in pesto and tomato-based dishes, but the plant is an effective mosquito deterrent too. The pungent smell deters pests. Basil grows well in containers or in the ground, making it a feasible option for people with no ability to garden traditionally. Another citrus-scented plant, lemon balm is a fast-growing plant that is easy for beginning gardeners to grow. It is both drought- and shade-tolerant.